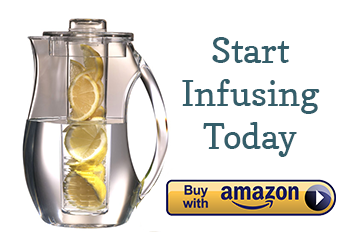 Packed with vitamin C, this citrus mixture is perfect for those who enjoy to drink and store their infused waters for several days. Cutting the rinds off result in a much sweeter, less bitter flavor than leaving the rinds on when infusing. 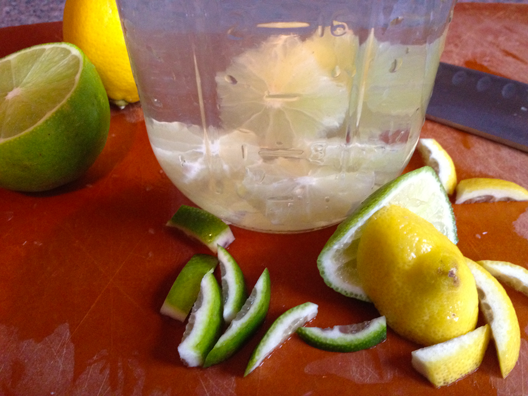 If you are serving this water at a party, infuse for 24 hours with rindless lemons and limes, then remove the fruit. Right before serving, add thin lemon slices as a visual garnish. Your guests will never know how you were able to get such deliciously intense citrus flavor from a few simple lemon slices, but it’s our secret! Recipe for a 32 ounce glass jar: 2 slices of lemon and 2 slices of lime, rinds removed. Squeeze the juice from the remaining fruit ends into your glass or container for extra flavor. And after you have removed the rinds, DONT THROW THEM AWAY! Take them and separate them into glass jars with lids and add white vinegar. Place in a dark spot for a few weeks, then strain and use for cleaning, laundry, anywhere you would use bleach….a little more bang for your buck with each lemon and lime that way. Use the lemon in your kitchen to wipe down counters, smells nice and is antibacterial, antiviral, antibiotic and antifungal. I was really hoping your site would help with the party I am planning since I googled infused water recipe party and your page came up. Unfortunately, you talk about using this for a party but then give a 32-oz portion. That is not much of a party. It would have been really helpful to have party-size proportions – like for a 3gal or 5 gal dispenser – given. What is the significance of removing the rinds? I always just squeeze my lemons and throw them in the jug. Is that bad? !